Do You Need a Private SEO Consultant? There’s a difference between an SEO Consultant and an SEO Agency. Read on to learn which will serve your business best. Are you preparing to outsource your SEO services? Search Engine Optimization (SEO) can transform your digital marketing efforts. When implemented correctly, it can be your secret to gaining better product visibility through higher Google rankings. Because SEO is a constantly adapting field, it’s important to consult professionals when developing your strategy. But some business owners aren’t sure whether they should hire a private SEO consultant or an SEO agency. Both are very different, and so it’s important to identify your needs before you make your hiring decision. In this post, we’ll help you determine which will serve your business best! You’ve recognized the great power of SEO, and you’re ready to get started with your first campaign. But do you require the assistance of an established SEO agency or the advice of an SEO consultant? SEO consultants are, in many ways, exactly what they sound like. They provide top-grade consulting on all things SEO–your strategy, your keywords, and how to implement a campaign. But they also are much more than that. An SEO consultant is an individual who directly takes your digital marketing needs into their own hands. Rather than working with a team of individuals, you’ll be working one-on-one with an SEO consultant. What’s more, a consultant will be both advising you and actively managing your account. They will be responsible for the entire SEO package, so to speak. There are many reasons why this may be helpful for you and your business. Let’s take a closer look. In general, because SEO consultants are individuals handling all of your SEO work, they are ideal for smaller businesses or those with relatively small digital marketing needs. You may be a small business looking to boost product visibility. Or you may be a local institution interested in using SEO to draw more local customers. Maybe you have a relatively small website and digital presence. Whatever the case, SEO consultants are, at the end of the day, individuals. They aren’t necessarily working with a team of other consultants. They also aren’t necessarily able to outsource extensive tasks. However, an SEO consultant can also be ideal for larger businesses looking for highly specialized attention to specific SEO issues. We’ll talk about this further in point 3. A lot of businesses are wary of outsourcing marketing efforts, fearing contracts and longterm relationships. However, SEO consultants don’t typically require year-long contracts. They are able to perform work in a short amount of time and at short notice. What’s more, consultants will generally charge a singular fee for services rather than a monthly bill. This can be advantageous for businesses looking for some nonbinding but effective marketing assistance for a manageable, one-time fee. An SEO consultant truly is an expert in the industry, and one of the finest at that. Consultants are generally well-versed in the field and more likely to address highly specific and complex marketing situations. This is essential when it comes to SEO, which is always changing with Google’s and consumers’ preferences. 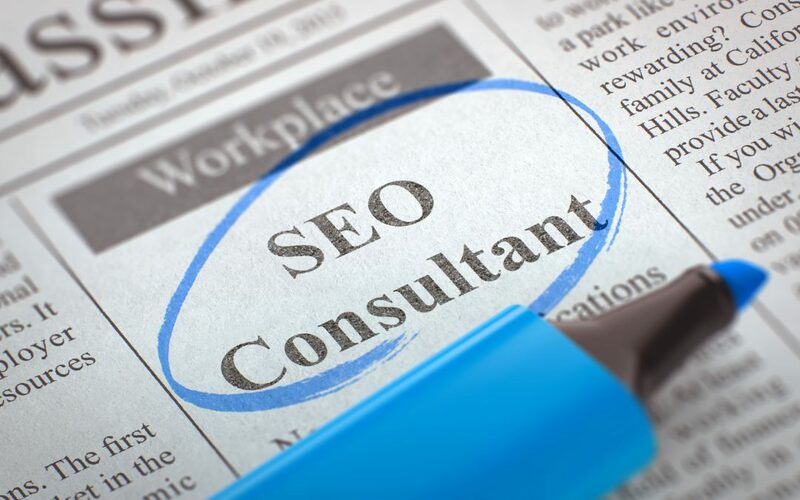 If you crave the best of the best when it comes to SEO expertise, a consultant is best for you. Because SEO consultants are typically specialized, they can also be beneficial for businesses with a variety of shifting SEO needs. If you’ve already implemented and SEO campaign and need a great data analyst to guide your efforts, an SEO consultant can do the job. Consultants are designed to jump into marketing campaigns at any step of the journey. What’s more, they can tackle spontaneous needs more effectively. Sometimes SEO consultants will be more expensive when it comes to digital marketing services. This is often simply because they generally charge a comprehensive fee upfront for services. This can be tricky for smaller businesses starting out with a tighter budget. But it can also be best for companies who are willing to make an investment in specialized, rapid-fire expertise. On the other hand, an SEO agency is what it sounds like: an agency designed to meet a broad range of businesses’ SEO needs. In general, an agency will connect businesses with account managers responsible for overseeing SEO efforts. Agencies incorporate a host of individuals with varying backgrounds in digital marketing. They also tend to involve longer relationships, providing services over periods of months or even years. An SEO agency can be best for you and your business if any of the following apply. An SEO agency is ideal for businesses with extensive marketing needs. This is especially the case if your needs go beyond mere SEO. Maybe you need help with web design, development, support, and maintenance. Perhaps you want some help with social media campaigns or content marketing. An SEO agency is typically expansive enough to encompass a lot of aspects of digital marketing. They can best serve companies who have a lot going on. An SEO agency generally provides services over a long period of time, charging for these on a monthly basis. There may or may not be a contract involved. If you foresee ever-growing digital marketing and web design needs, a longterm agency relationship may be just what you need. In a similar vein, if you are a larger company anticipating future digital growth, it may be wise to consult an SEO agency. An agency is likely to build a longterm relationship with you. As such, they’ll be able to accommodate any expansion and even assist with new technology integration and platform mobility. SEO consultants and agencies are quite different, so it’s essential to identify the benefits of both in order to choose what is ideal for you and your company. In general, an SEO consultant will provide businesses with more specialized and engaged SEO consulting and implementation. Consultants generally offer more advanced SEO knowledge than agencies, although they can be costly. An SEO agency can manage a variety of digital marketing needs at once and develop long-term relationships with businesses. Agencies can accommodate future growth and tighter budgets. At Buzzhive Marketing, we have good news for you when it comes to your SEO needs. We offer a variety of digital marketing packages that can comprehensively address all of your advertising efforts! Reach out today to start a conversation.